(1) 8 1/2 x 8 1/2"
2. When you get home, chuck in the 1 3/8" Forstner bit, and drill a hole in the center, about 1/3 of the way down from the top, of one of the 5 1/2" pieces. My center point was 1 13/16" from the top, and 2 3/4" from each side. 4. Once everything has dried, find the center line along the face and the back, and drill 1" deep hole 1" from each side with the 5/16" bit. 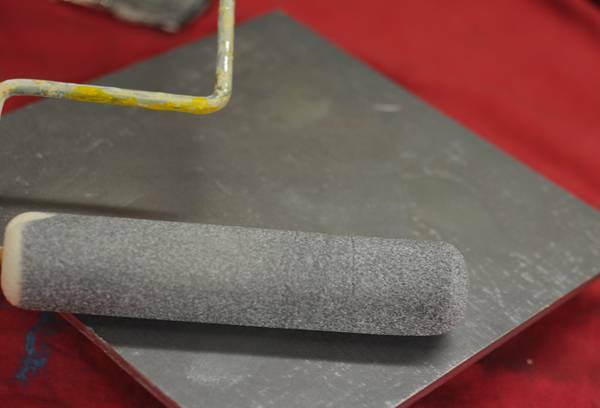 Use a piece of painter's tape to mark the depth on the drill bit. Then, drill matching holes on the back. 5. Then, drill a 1/4" hole in the roof to accept the dowels at 2 1/2" from the front and side. It's best to drill the back holes about 30-degrees and the front around 40, to welcome the angle of the roof. If this is too overwhelming, don't worry about it. Just drill it at 90-degrees and make the roof flat. Easy peasy. 6. Then, cut the dowels into rough, too-long lengths, and assemble everything for a dry fit. You can make the roof sit as far away from the walls as you'd like. Mine is about 1 1/4" in the front, and 1/2" in the back. 7. Use the pliers or a small saw (if you have one) to cut the dowels flush to the roof, and use some rough grit sandpaper to sand everything flat. 8. Fill the dowel holes on the roof only with glue and let dry. 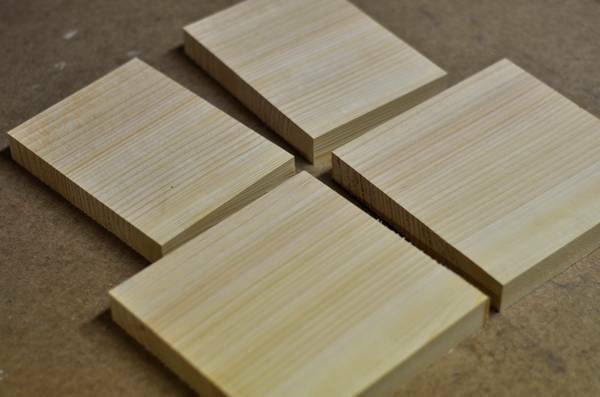 If you're particular (like me), you can use wood filler to fill in any gaps, but that's totally optional. We're going to let the roof just float on the body, so that it can be easily removed to clean out any old nests to welcome new birds. So! Be sure not to glue the dowels into the body. They're a 1/16" bigger so everything slides out easily. 9. Sand everything smooth, and paint the roof/dowel combo with exterior grade paint. You don't have to finish the body, as cedar is naturally decay-resistant. If you do, be sure to use something that won't hurt the birds, like boiled linseed oil. 10. Lastly, you can install the birdhouse. I chose to mount it on its own stand, using 1/2" black pipe and a floor flange. I installed a 3" x 3" piece of cedar inside to provide a structure to accept the screws. You could also flush mount it to a house using mending plates, or strap it to a tree. Special note: I put mine in the ground on Thursday evening, and by Saturday morning, a beautiful gold finch was already coming in and out, and there's the beginnings of a nest in there already! Awesome. Anyone interested in design and architecture can appreciate the brilliant combination of modern materials and contemporary lifestyle patterns from the classic mid-century modern ranch home. But rare is the lucky individual that'll every live in an Eichler or an iconic Case Study House. Heck, most of us will never even live in California. 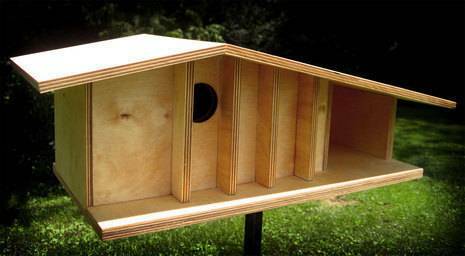 So bring some modernism to your house, whatever its era, by creating a home for your native avian population by building a mid-century birdhouse. I've included my measurements and process here, but feel free to model yours after architecture you love. And don't worry if you don't have a full collection of woodworking tools (I don't either...) You can build a birdhouse with any handsaw, an electric drill, and glue. Or, you can borrow tools from a local tool lending library or have the employees at your local lumberyard or home center make the cuts for you. Press play above, or view the video here. 1. Design your birdhouse with plain old graph paper and a pencil. Consider the size and weight of your final project. 2. Create a "cut list" by listing the measurements of each of you facades, i.e. base, front wall, back wall, left wall, right wall, roof one, roof two, etc. Something to consider (which I did AFTER mine was glued together), is a way to access the inside of the space to clean out old nests, pests, etc. A trap door in the bottom or back, seems like it'd would the trick. If you're following my design, the inside wall of the 'carport' area would be a good option. 3. Cut your wood to size. I used Baltic birch plywood, cause I like the hi-ply of the exposed edges. Soft woods like pine and cedar are fine as long as you're painting the final product. 4. 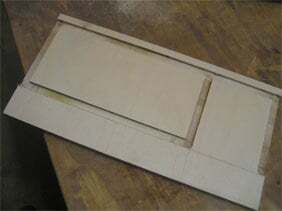 Do any extra joinery cuts that you might wish. For example, I cut 1/2" rabbets in my side walls, and 1/2" dados at a 1/4" depth where all my walls sat in the base avoid using large mechanical fasteners, like screws, and as a learning exercise in making stopped dado cuts. 5. Assemble your pieces for a dry fit, check it over, and then once satisfied, glue the whole thing together, adding small nails or even screws if necessary. Let it dry overnight. 6. Finish your project as you wish. Remember, this is going to be outside, and raw wood doesn't stand up to the forces very well. Whatever you use, be sure it's safe for the birds to live in. Don't do anything to the inside, just the exposed surfaces. Paint is really the best option, but anything that's designed for long-term outdoor use will work, as long as you're up to reapply every few seasons. 7. I chose to mount mine free standing, but you could hang yours from a tree or set it atop a fence or handrail on a deck or balcony. To mount as I did, screw a 1/2" black pipe flange to the bottom of the birdhouse (using pilot holes to avoid splitting the wood), and attach it to a long 1/2" black pipe, both of which are available in the plumbing section of the hardware store or home center. Purchase a pipe at least two feet longer than your desired height, as you really need to sink it to eliminate any wobble. If you have a permanent location, digging a bigger hole and filling it with some Quikrete is a good idea. (Don't be afraid, just follow the directions on the package). 8. Create a choice cocktail in a vintage martini glass or tiki mug, throw on some bossa nova, and watch your new feathered friends come home. Note: In researching the design for my birdhouse, I found those from Weiler to be very helpful.